Føroyar. That’s the local word for the Faroe Islands and its proper name. It’s a series of islands about halfway between Norway and Iceland, and is technically part of the Kingdom of Denmark, though it’s autonomous. I had a chance to make my way to this remote spot and explore it by foot, car, and plane. What I discovered was a lush land, wild weather, open roads, and this-can’t-be-real moments around each bend in the road. Drangarnír is not easy to access. 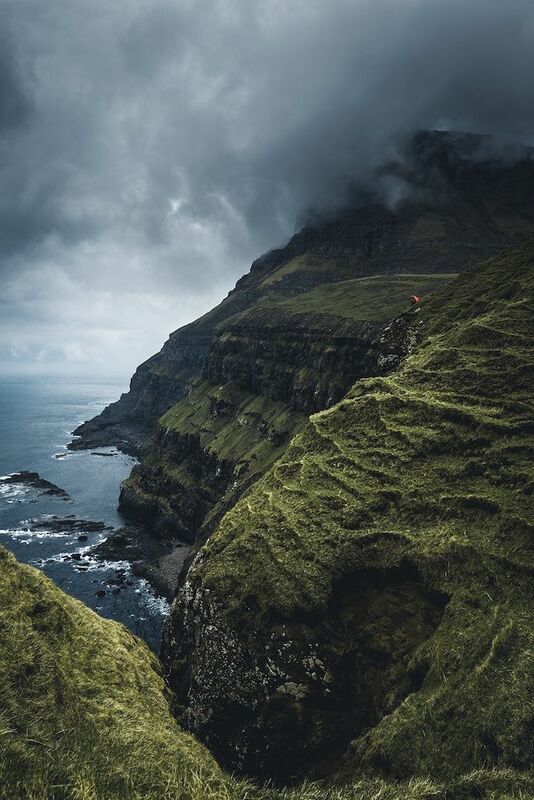 I drove to a small Faroese village, parked, climbed a fence, and walked for two hours straight up a slope without meeting a single other human being. When I arrived, most of the area was covered in thick Faroese fog. But, waiting almost always pays off on the Faroe Islands - conditions change extremely fast. 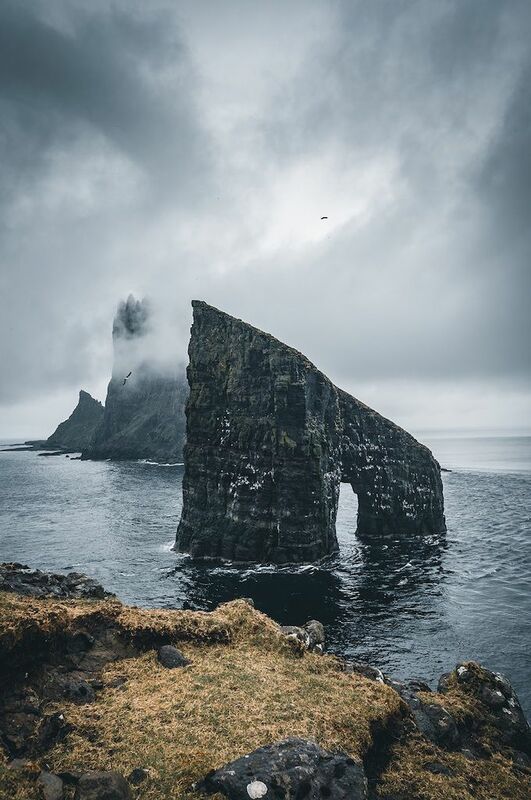 The fog slowly started to diminish, uncovering the island of Tindhólmur that lies behind the majestic arch. I couldn’t have dreamed of better conditions to reflect the moodiness of this place. From the same spot, I launched my drone and flew it over to the island behind the arch to capture it from above as the fog moved off. This island reminds me of a dinosaur swimming in the ocean. I was so blown away by the scene that I spent an hour flying my drone around and capturing the spot from all the different angles. Nature truly put on a show for us. Gásadalur is a village that is well-known for the waterfall that dramatically crashes into the ocean at its feet, but there’s more to it. Behind the town lies a bench with this mind-blowing view. What you can’t see on the photo is that it was incredibly windy, so much so that it wasn’t easy to get the shot. I absolutely love the combination of the greens from the grass and the blues of the ocean in this photo. My friend Jack, the guy in the orange jacket, puts the massive cliffs into scale. Be careful if you climb around them though - it can be dangerous. 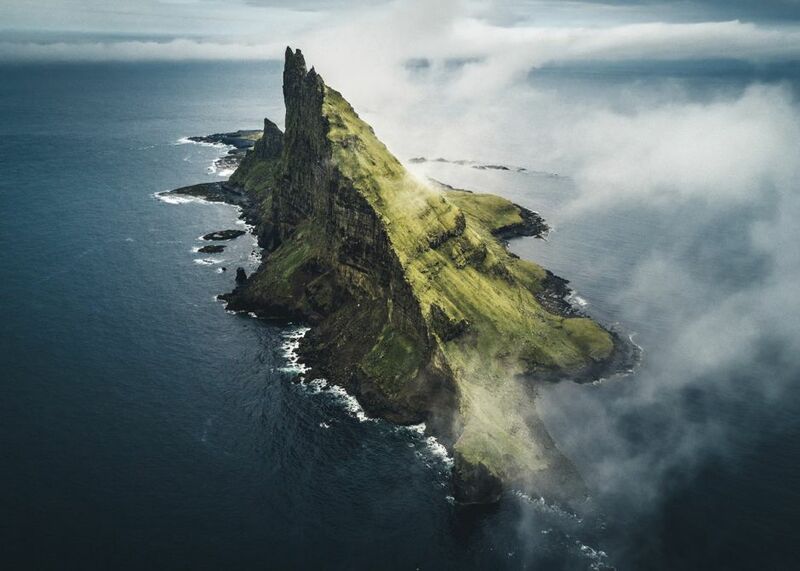 Viðareiði is the northernmost town on the Faroe Islands. There’s just one road that leads to this place and it involves single-lane tunnels to boot. 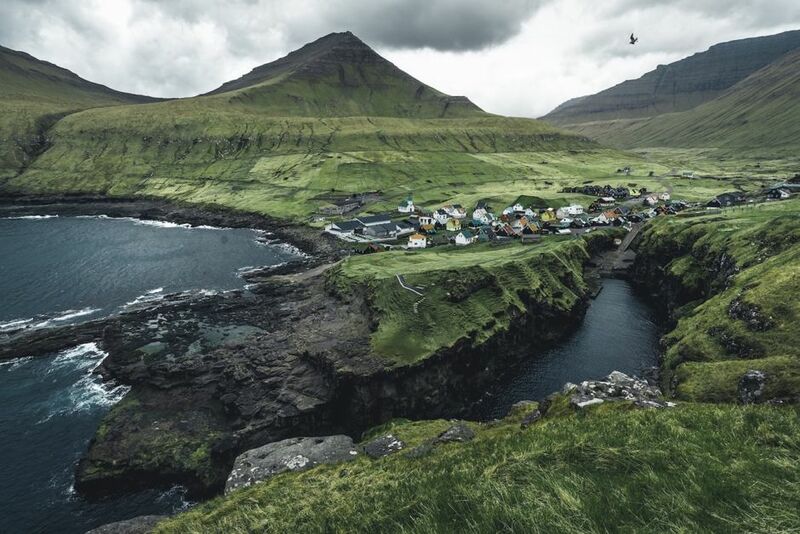 Viðareiði is surrounded by mountains on both sides, which makes the town look all sweet and tucked in. 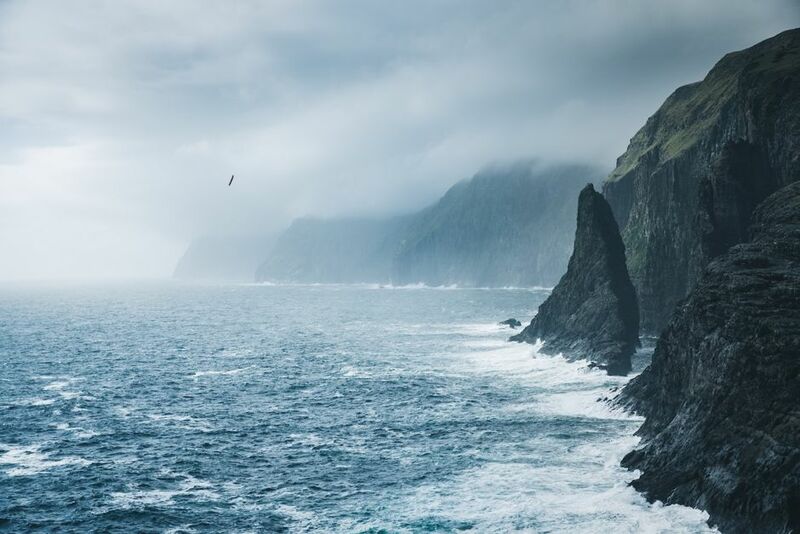 But it also makes for insane views: cliffs on the left, cliffs on the right, a sharp horizon, and sun rays breaking through the moody Faroese clouds. It was hard to leave this place, but as dusk rolled in, so did my hunger. As restaurants are scarce outside of the major town centers of Tórshavn or Klaksvik, I decided to leave. Remember to pack snacks. 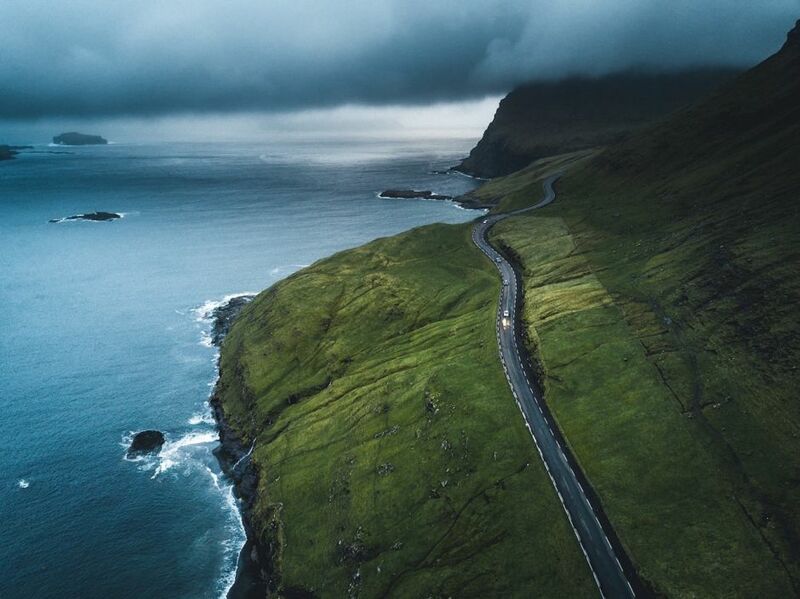 I got a chance to fly in a small plane above the Faroe islands, and I noticed two things about the roads etched through the landscape. One, how precarious they could look as they weaved particularly close to the cliffs; and two, how few cars there were. When it rains (which it does regularly), waterfalls start running down the side of the mountains about every 50 meters. The lack of cars made for an enjoyable road trip back on land - often ours was the only car on the road. 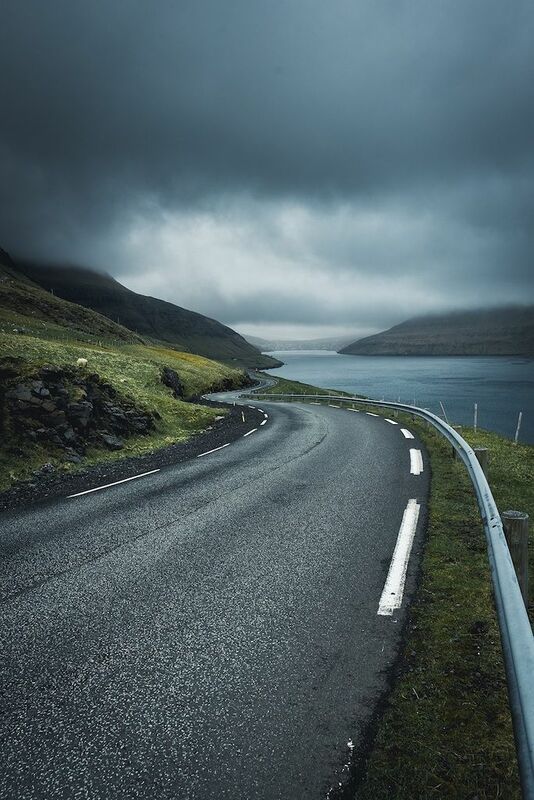 One thing to watch out for while driving are the sheep; the Faroe Islands have more sheep than inhabitants. If you get into a traffic jam, it’s clearly not with other cars. It’s with sheep. Føroyar is bird paradise. It also has views for days, extremely heavy winds to play with, and lots of fish (we assume, given the birds chowing down). Without a human in the photo, it’s always hard to get the majesticness of these cliffs across - they’re several hundred meters high. 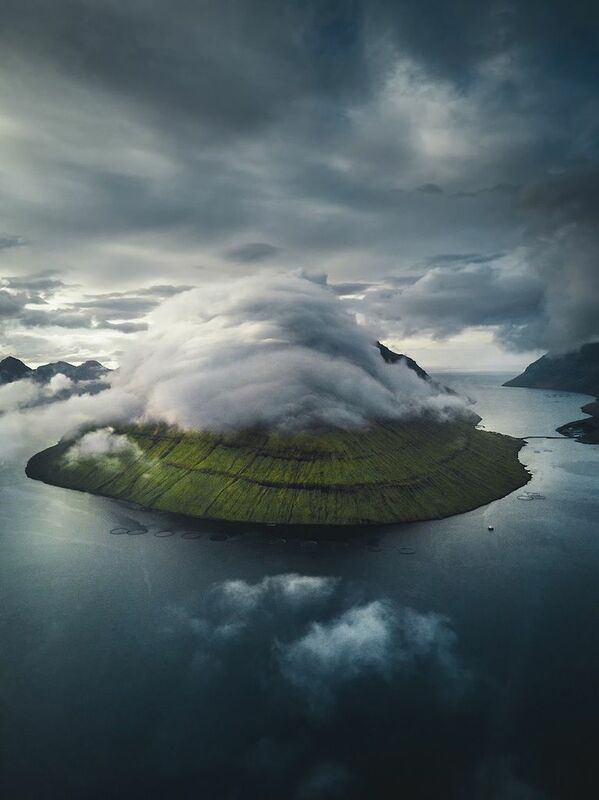 Sørvágsvatn lies on the island of Vágar, and it’s one of the more accessible locations of the Faroese Islands. It has a path leading all the way from the parking area to the ocean, about a one-hour hike. This is what lies behind the cliffs of the previous photo. Even though I was completely safe from the waves below me, I still felt a huge amount of respect towards the ocean while standing here. I’ve never seen a natural force as powerful as the sea on that day. The collision of waves sounded like explosions and I felt the noise in my stomach rather than in my ears. Still doubting how windy it is on the Faroe Islands? I had to hold onto wooden pillars for this shot so the wind wouldn't push me over. Walking was hardly possible and the seagulls you see in this shot actually couldn't fly against the wind - they seemed to enjoy the storm quite a bit though, just kind of hovering in the air unable to fly forward. This is the town of Gjógv with its natural gorge harbor. 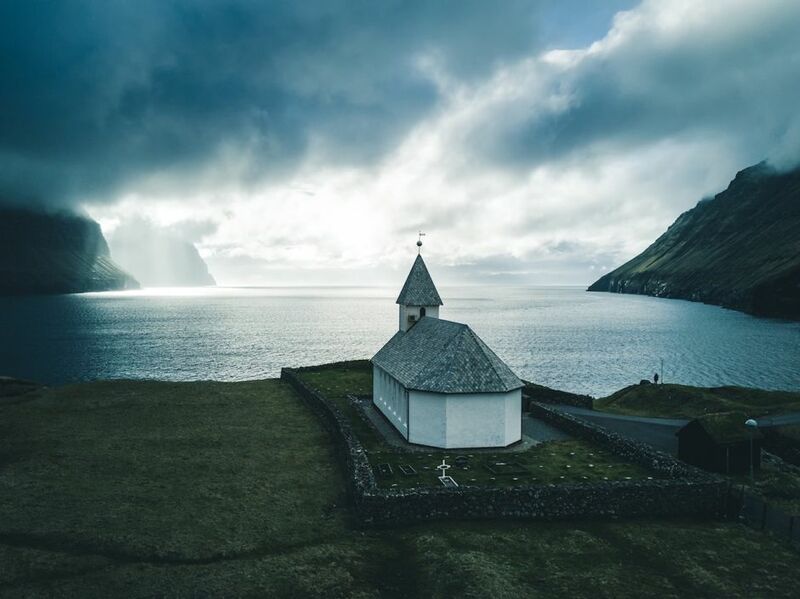 Witnessing nature's incredible power, beauty, and vulnerability in a place like the Faroe Islands made me appreciate how special it all is. 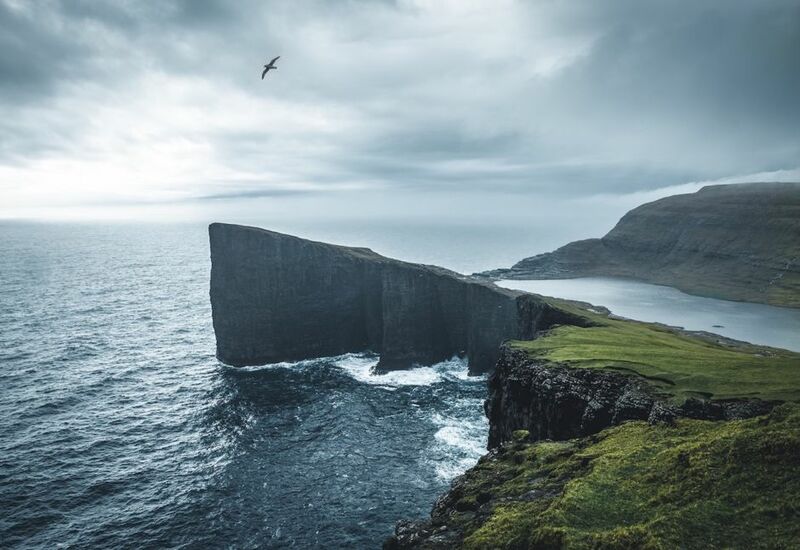 I left inspired to respect nature more deeply, and take action to protect our planet so future generations can show up to the Faroe Islands and have the same experiences that I did.